Students pursuing a minor in American Indian studies examine additional interpretations of United States history, law and politics as they relate to indigenous communities in the United States. You'll develop insight into the histories, contributions, social, cultural and political development and intellectual expression of the American Indian communities. Your courses will broaden your understanding of issues that confront American Indian communities and will help you understand, work with and empower diverse communities. Coursework on sovereignty and the unique relationship between the United States government and tribal nations. Useful insight for fields such as education, political science, law, mass communications, community programming, art, psychology and social work and business. Opportunity for global and comparative analysis between ethnic minority groups, indigenous communities, and their relations in their ancestral homelands. Student assistance with admissions, financial aid, personal concerns, academic concerns, tutoring, advising, housing, and career development through the American Indian Center. Education Abroad allows comparative study of race relations in post-apartheid South Africa and in the post-Civil Rights era of the USA. American Indian Center (AIC) sponsors summer workshops in Native Studies and Native Skywatchers for teachers. AIC is a co-sponsor of the annual Power in Diversity Leadership Conference. 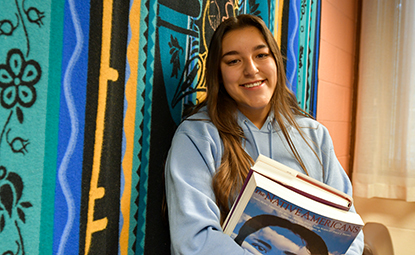 20-year-old center is host for community social and educational programs including a speakers bureau and an annual pow wow and sponsors an American Indian Speakers series that has included leaders such Craig Howe, Janice Lafloe and Sherry Sanchez-Tibbets. AIC organizes a service trip to Northern Cheyenne Reservation in Montana during spring break.